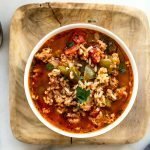 All of your favorite ingredients in sausage and rice stuffed peppers in soup form. This easy, one-pot recipe is a breeze to make, hearty, and delicious. Begin by heating the olive oil in a large stockpot over medium heat. Add the sausage and brown until cooked through, about 7 minutes. Tranfer the cooked sausage to a plate lined with a paper towel to drain some of the grease. Add the onions and peppers to the pot and cook until soft, about 7 minutes. Add the garlic cloves, Italian seasoning, salt, and pepper and cook for 2 minutes, then add the rice, parsley, diced tomatoes, chicken broth, water, and the cooked sausage to the pan. Bring the pot to a boil, reduce to a simmer and cover. Cook for 30 minutes, or until the rice is fully cooked and serve!